The IT Marketing Crash Course, from MailerMailer, provides entrepreneurs and marketing professionals a detailed action plan to get more qualified leads and close more sales for their technology business. MailerMailer has released a new book called "The IT Marketing Crash Course: How to Get Clients for Your Technology Business," authored by Raj Khera, CEO of MailerMailer. The book includes strategies, checklists, examples and action plans that lead to new customers. It is filled with stories from technology business owners and executives who describe how they are generating hundreds of qualified leads through clever marketing tactics. Khera, who has built several Internet companies including GovCon and MoreBusiness.com, wrote the book specifically for providers of IT consulting services, managed services, web and mobile application development, software development, cybersecurity and network services. International best-selling author of "The New Rules of Marketing and PR," David Meerman Scott, says "Raj is a superstar marketer whose strategies I've followed and written about for years. Now he shares his techniques for success with you in this entertaining book. I'm confident his proven ideas will benefit your business." Dale Coyner, Founder of Communicast Inc. says "The book dives right into actionable steps to help technology companies win more business." 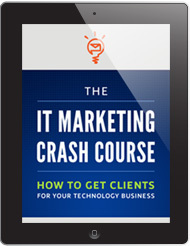 IT Marketing Crash Course is available on Amazon in Kindle and Print editions at http://bit.ly/itmarketing. Raj Khera is co-founder and CEO of MailerMailer, an email marketing software company, which serves thousands of customers worldwide to help them generate warm leads and win new business. Prior to MailerMailer, he co-founded GovCon, which he and his partners grew to be the largest business-to-government web portal and sold it to a publicly traded company. In 2012, he was appointed by Maryland Governor Martin O'Malley to the Maryland Economic Development Commission. He also serves on the Board of Visitors for the University of Maryland's College of Computer, Math and Natural Sciences and several other boards. For more information about IT Marketing Crash Course: How to Get Clients for Your Technology Business, please visit http://www.ITMarketingCrashCourse.com or contact Raj Khera at 1-800-475-1415. MailerMailer is an award-winning do-it-yourself email marketing and list management provider that makes non-technical people look like email marketing geniuses. MailerMailer is part of a series of sites run by Khera Communications, which includes Presstacular, a lead generation tool for IT consulting companies to win new and repeat business using email newsletters. Presstacular includes a library of strategically written articles for clients to use and edit and even offers custom articles. This eliminates the time-consuming task of drafting a newsletter every month to nurture leads. Also, every article that a client selects instantly becomes part of their blog, which is designed to match their website.